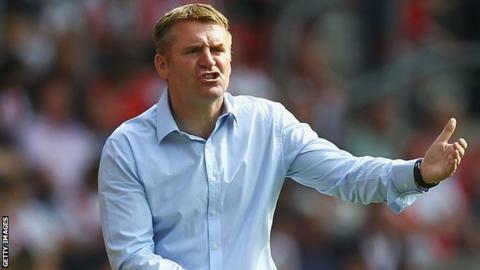 Walsall boss Dean Smith says he is impressed with the squad that Portsmouth have built despite their financial difficulties. Ahead of Walsall's date with Pompey at Fratton Park on Saturday, Smith said: "There'll be eyebrows raised by a lot of clubs at the calibre of players they are signing and what they're earning. "We can only concentrate on Walsall Football Club and what we do. "But I don't think they've been shopping at Lidl's," he told BBC WM. He added: "They've got some really good players, Lee Williamson from Sheffield United, Darel Russell from Preston, Luke Rodgers, Brian Howard, Izale McLeod. "Michael Appleton's got to get in the best players he possibly can and he's done it well. "They've regrouped and assembled a decent squad." Walsall have not won in seven visits to Fratton Park since March 1980. But the Saddlers head for the South Coast on the back of a four-game unbeaten run in League One, having not lost since the opening day 3-0 home defeat by Doncaster Rovers. Portsmouth could be a different proposition, however, in the wake of the confidence boost of Sunday's televised win at Crawley - a first win for Appleton's hastily assembled side since being relegated last April. "They're on the back of a really good result at Crawley," said Smith. "There were a couple of contentious decisions but they played well to get their first win of the season."